Welcome to the web site of Vision Zero Canada, a registered nonprofit devoted to the elimination of death and serious injury on Canada’s roads. At time of writing (11 July 2016) this campaign is being run entirely by Graham Larkin, as announced in a December 2015 post on my Slow Ottawa web site. Before today its public face was a Twitter feed with 1350 followers, along with the safe speeds campaign Love 30 Canada that I launched in June 2016. This post provides a run-down of the Vision Zero Canada activity to date. Vision Zero combines ethically-rigorous traffic safety principles, including a commitment to the timely achievement of zero traffic deaths and serious injuries, with a holistic “Safe Systems” approach dedicated to achieving that goal. When safe systems are in place, serious injury and fatal crashes have a hard time penetrating the multiple shields of safe vehicles, safe roads, safe speeds, and safe drivers. While there are educational and enforcement components to these systems, the focus us largely on design that protects road users, including cyclists and pedestrians. Safe speeds are also crucial, as you can see from the information at our sister site Love 30 Canada. A superb video from the Swedish government claims that Vision Zero boils down to the following principle. This site lays out some of these basic principles and practices. The plan is to develop this content, including a detailed description of effective safety measures, and to continue advocating for their implementation throughout Canada. The original, and arguably the soundest form of Vision Zero is the one adopted by the Swedish government in 1997. Within a dozen years the number of traffic deaths was reduced by 34.5%. The current targets are a death rate cut to 50% by 2020, and to 0 deaths by 2050. It is time that Canadian governments established similar goals, and invested in similar safety measures, at the federal, provincial and municipal levels. So far North America has only embraced Vision Zero on the municipal level. In recent years the term has also been embraced, in one form or another, by various U.S. municipalities. In September 2015 the City of Edmonton announced a Vision Zero policy—a plan rolled out with the release of an excellent video and other information promoting the notion that “no loss of life is acceptable.” The city committed to reducing the rate of collision injuries from 3.4 to 3.0 per 1,000 population by 2020, but they did not set a zero target date. Elsewhere the report (PDF) makes reference to a “Towards Zero” plan, which is more than most Canadian cities have done. Of course what really matters is the reduction in death and serious injury, and related factors such as the increase in active transit. Some Canadians have ably grasped and articulated a true Vision Zero approach. Best practices are beautifully analyzed in Neil Arason’s book No Accident: Eliminating Injury and Death on Canadian Roads (Waterloo, Ont. : Wilfrid Laurier UP, 2014), which has formed a crucial inspiration for the current project. In December 2015—the month that Vision Zero Canada was incorporated—Parachute Canada released a video in which Swedish transport safety expert Matts-Åke Belin lays out his country’s uncompromising traffic safety principles and practices. This is the world-class Vision Zero that we need to strive towards. 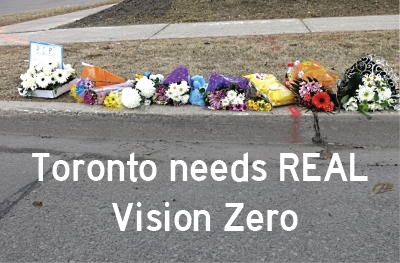 The Vision Zero Canada Twitter campaign has resonated both nationally and internationally. Within months of launching it I was contacted by the organizers of the wildly successful 20’s Plenty for Us safe speeds campaign in the UK. 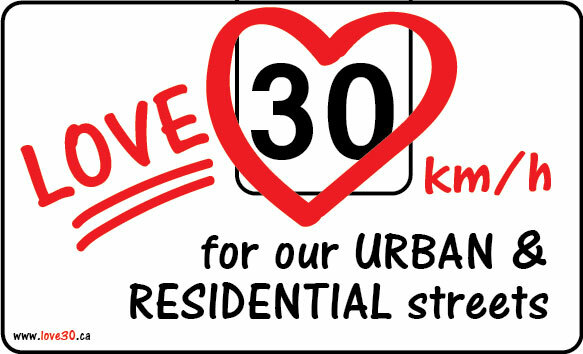 Following some great conversations with founder Rod King MBE, I am now partnering with them on the Love 30 Canada campaign to promote 30 km/h (~ 20 mph) speed limits on our residential and urban streets. While it’s generally accepted that drunk and distracted driving are a danger to us all, speeding is accepted to an alarming extent, and safe speeds need to be more widely recognized as an equitable and cost-effective component of traffic safety. More generally, the commitment to zero traffic deaths and serious injuries has been spreading at the speed of social media. The Vision Zero term has been embraced—and the green-and-white logo has been adopted or adapted—in campaigns across Canada. Here are a couple of examples of the logo popping up. But the most dramatic indication of Vision Zero progress in Canada is probably the anomalous series of events that transpired in Toronto on June 13, 2016. Torontonians knew in advance that Mayor John Tory would unveil his much-anticipated pedestrian and cyclist safety plan on that day. In readiness, Metro News Toronto prepared a full week of smart, hard-hitting traffic safety stories promoted with the hashtag #TOdeadlystreets. On the Saturday before the announcement the Globe & Mail published Oliver Moore’s superb analysis of pedestrian deaths, which included a half dozen references to Vision Zero. While other news outlets, including Maclean’s and Global News, had laid the groundwork with stories describing Vision Zero, the intensity of the Toronto media coverage surrounding Tory’s June 13 announcement really felt like a tipping point in public awareness. As expected, Tory began the day by announcing a modest financial commitment ($40M over five years) to the safety of vulnerable users. He also announced his commitment to a traffic death-and-injury reduction target of 20 per cent within a decade. That commitment turned out to be a serious tactical error—a failure to recognize the success with which we had hammered home the principle that a zero death target is the only ethical alternative. Tory was immediately savaged in social media, with ample use of the #ZeroVision hashtag. Then something extraordinary happened. Late in the day, Councillor Jaye Robinson, chair of the public works committee, which will debate the plan, said she would introduce a motion to change its target to zero people killed or seriously injured within five years. A spokeswoman for Mr. Tory confirmed that he would support this when the plan comes to council. It’s had to know what to make of this sudden and dramatic change in position. On the one hand, Robinson and Tory’s embrace of a zero target is a clear victory for team Vision Zero, since it proves that the message is resonating. On the other hand, Tory’s statement of intent (one can hardly call it a policy) rings hollow in the absence of the required budgetary commitments and strategic plan complete with interim targets. Pressure from journalists and advocates led to an additional 30% bump in road safety investment, for a total of $52 million over five years, but this is still a timid number and getting to zero on that budget is unimaginable. Nor was it encouraging to see a majority of Toronto councillors back a whimsical plea for a province-wide ban on “distracted walking”—a move quickly denied by the Ministry of Transport, to their credit. One good move for Toronto would be the rapid implementation and expansion of the 30 km/h speed limits that have already been approved in downtown Toronto wards. Automated radar enforcement of safe speed would be another good step, as would serious Vision Zero commitments from the provincial and federal governments. Now that so many Canadian municipalities are looking at a bold and holistic approach to traffic safety, it is important to propagate sound Vision Zero principles and best practices, and to strive for their implementation at the municipal, provincial and federal levels. The purpose of this site is to serve as a constantly-evolving road map for these improvements. While this journey will entail sensitivity to local challenges and opportunities, there will also be an emphasis on fundamentals. The following message seems like a good place to start. If you believe in this project, please support it. I’ve made it easy for people and organizations to donate securely, and to be acknowledged as founding sponsors. I would like to develop features that you don’t yet see, such as a community advocacy toolkit; a long-form audiocast (like the ones here and here) on which Neil Arason has already agreed to come as a guest; and regular updates on developments of note. I’m also designing some swag in the form of bike and bumper stickers printed on the highest quality weatherproof vinyl. These will be distributed to all donors of $30 or more, but to be able to print them I’ll need some funding in advance. Finally, I’d love to visit your community to speak and develop policy in support of local Vision Zero and Love 30 Canada campaigns. This entry was posted in advocacy, Canada, road safety, Vision Zero and tagged advocacy, Canada, road safety, Vision Zero on July 11, 2016 by grahamlarkin. Congratulations on this much-needed initiative; I will do what I can to promote it. Thanks Lloyd. I’ve long admired your writings for the historical perspective, the advocacy for sustainable practices, and the clear, image-rich exposition. You have an open invitation to come onto the audiocast, which I hope will launch soon.